NORDEN received an award for “Outstanding effort in the field of responsible supply chain management in the shipping industry” at the International Marine Purchasing Association’s (IMPA) Annual Conference in London in September 2015. 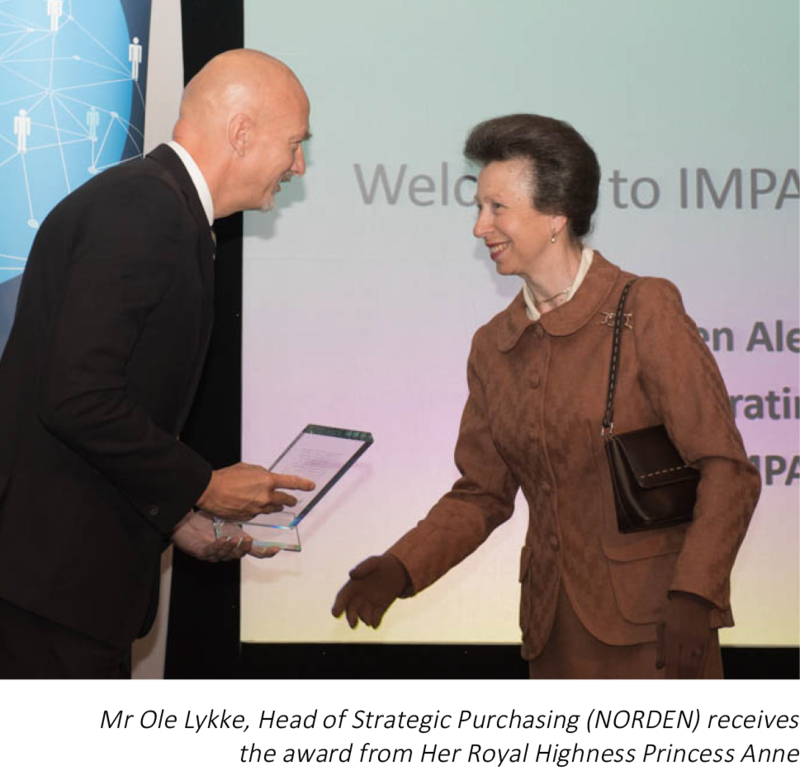 The award was presented to Mr Ole Lykke, Head of Strategic Purchasing by Her Royal Highness Princess Anne. The award was given to both NORDEN and J. Lauritzen A/S for our contribution in founding the IMPA ACT Responsible Supply Chain Management programme. IMPA ACT goes beyond the requirements set by the UN Guiding Principles on Business and Human Rights (UNGPs) and includes provisions on anti-corruption and the environment. The aim is that IMPA ACT will become a maritime industry standard, as a common approach will ensure consistency and prevent that suppliers receive too many different codes of conduct. Moreover, it will reduce costs and resource consumption in the short- and long- term both for the company but also for the supplier. Today, NORDEN’s work with responsible supply chain management is centered in Strategic Purchasing in NORDEN's Technical Department. Next step is therefore to implement responsible supply chain management throughout the whole organisation, so employees who purchase goods and/or services on behalf of NORDEN make use of responsible supply chain management when dealing with their suppliers. To accomplish this, NORDEN has decided to make use of the concept Train the trainers. In the autumn of 2015, training sessions were held with the other purchasing functions in the Technical Department. They were introduced to the programme and its different steps, tools and working documents. They will hereafter train other departments in NORDEN with support from the CSR Department. NORDEN's aim is that all employees who purchase goods and/or services on behalf of NORDEN will be working with responsible supply chain management within the next 2 years. NORDEN engaged with 5 new suppliers in 2015 who were chosen based on spend, dependency and frequency. These are the same selection criteria NORDEN uses every year to select suppliers to engage with. 2 of the 5 suppliers NORDEN engaged with in 2014 have finalised the IMPA ACT process while the other 3 are still undergoing the process. NORDEN aimed to conduct a handful of third party vessel observations in 2015. The purpose of these observations is to collect information and experience that will enable NORDEN to establish and pinpoint what measures to take in the future to ensure that third party vessels uphold classifications and flag state requirements. NORDEN has decided to prioritise other issues in 2015 and we have therefore postponed the observations until 2016.